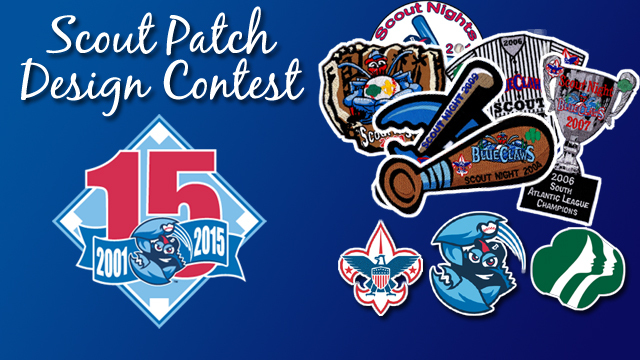 Winning patch will be given out to all scouts at BlueClaws games this year! The BlueClaws are holding their annual Scout Patch Design Contest to determine the official patch that will be given out to scouts at Scout Nights this summer. Click here to download the official contest rules and a design template. Use 10 colors or less to fill in the circle with your patch design. Please note on each sheet the scout's name and their parent's contact information. As a reminder, 2015 is the BlueClaws 15th season in Lakewood, so keep that in mind when designing your patch! The winner will be decided on April 1st, and will be rewarded a ceremonial first pitch before whichever 2015 Scout Night they attend. In order to be eligible for the contest, a Scout must be a member of a pack that has already booked its 2015 outing with the BlueClaws. For additional information about the BlueClaws Scout Program, visit www.blueclaws.com/scouts. If you have any further questions about the contest or booking a Scout outing at one of our Scout Nights, please contact Kyle Volp at 732-901-7000, ext. 142.